Happy Thursday! Are you looking forward to the long weekend? We know we are! But before you're off enjoying the end of summer holiday, don't forget to link up your blogs and meet some new blog buddies! Thank you to everyone who linked up with us last week. It is always a challenge choosing only three to feature. We can't wait to see everyone's posts this week! Hope you have a great weekend! You know we love leopard, especially the leopard pumps from Target. 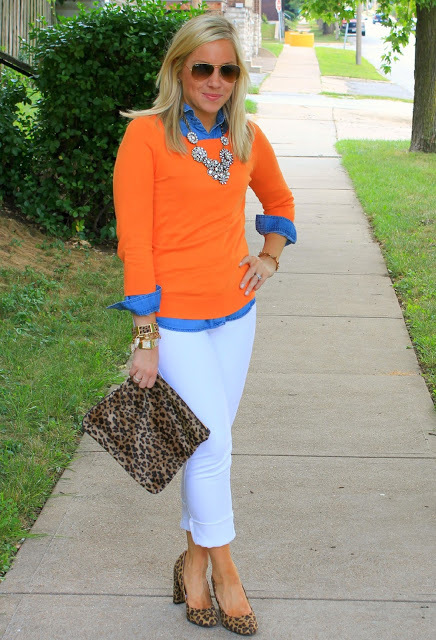 Jaqueline of Stylin in St. Louis styled hers with white denim, chambray and a bright orange sweater. 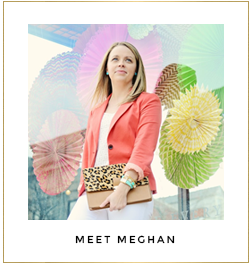 We love how vivid this outfit is with the orange and leopard paired against the white. Kate of Kate Styled Pretty looks absolutely stunning in this red maxi dress. We love the color and think we just might need to find a ball to attend so we can get this fab dress! Lauren of Fizz and Frosting couldn't hold out any longer and put together this perfect fall outfit! The peter pan collar tee is on our wishlist, and we love how she paired it with a burgundy pencil skirt and leopard heels. Great outfit for work!